When it comes to SEO, one of the essential metrics that is oftentimes overlooked is the ‘bounce rate’. Prior to delving deeper into the concept and how it determines the success of SEO campaigns, it is important to know in brief, the meaning of the term ‘bounce rate’. It is regarded as the percentage of visitors that visit a particular website and navigate through the different web pages or simply ‘bounce’ or leave the website after just viewing an individual page. The time spent browsing through the website by the visitors is significant for the search engines to understand the character of the website. 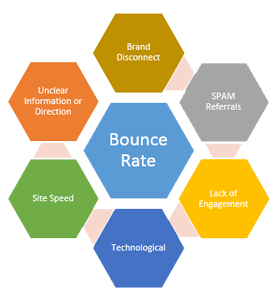 Whenever the term bounce rate is mentioned, it usually implies a negative connotation. In the terms of a layman, if any visitor opens a web page and leaves the website just after viewing that particular web page and does not navigate to the other web pages, it is not regarded as good for any business. This is because in the eyes of search engines (let us consider Google in this case); it means that the website does not contain the relevant information pertaining to the searched topic and this does not give a good impression to Google about the website. As a result in the eyes of Google, the website does not deserve a good ranking. And your SEO efforts suffer a setback. In the event, your website is driven mainly by content, the SEO strategies ought to be worked out in such a manner so that your website receives maximum web traffic and also the click-through-rate or CTR should be high. of the visitors to your website. Last but not the least, Google’s RankBrain or the algorithm that is responsible for determining the search results. This algorithm helps in “refining” the search results simultaneously maintaining complexities. An important aspect, however, that you ought to keep in mind is that there are many such companies that do not make use of Google Analytics. In such case, the bounce rates for the websites of these companies cannot be tracked accurately.